From rainbow-hued enameled stew pots to lightweight nonstick frying pans, the metal and ceramic vessels we use to heat our food are such an everyday aspect of the kitchen that they’re easy to take for granted. But make no mistake: the invention of the pot was, after fire, one of the most important innovations in cooking. You’ll want to hug your favorite skillet after coming along with us on this journey, which ranges from some of the earliest clay pots ever found in what’s now the Sahara Desert, to the British round-bellied cast-iron number that kickstarted the Industrial Revolution, to a legal challenge in Ohio that raised the question of Teflon’s health and environmental impact. Plus, can science help us find the perfect pot or pan? Listen in to find out. In our last episode, we covered one of the most important innovations in human history: cooking food over fire. But, although cooking may have made us human, it is the invention of pots that made us into cooks. As Bee Wilson, author of Consider the Fork and frequent Gastropod guest, explained: “Pots led to cuisine itself. To me, it’s the great beginning of cookery.” Tens of thousands of years ago, the invention of pots brought with it life-changing benefits: prolonged cooking could slowly break down plants like yams and cassava that would have otherwise been inedible; the process releases more starches from foods and therefore more calories; long boiling kills harmful microbes and thus makes food safer; softened food like grains could be fed to babies, allowing children to be weaned earlier and leading to yet more children and early population growth; and finally, the ability to create dishes that were cooked slowly and indirectly, mingling many different ingredients, made the business of eating a lot more delicious. The power hammer at Blu Skillet (left); Patrick Maher shaping the bowl of the pan by hand (right). Photos by Cynthia Graber. But how did we get from those earliest examples of clay cooking containers to the incredible variety of shapes, sizes, and materials found in kitchen cabinets around the world today—and what stories can those pots and pans tell over the years? In this episode, Gastropod visits Blu Skillet in Seattle, Wash., to watch a carbon steel pan being forged and smithed by hand. Julie Dunne, a.k.a. @thepotlady, a biomolecular archaeologist at the University of Bristol, describes her discovery of the earliest known pots used to cook vegetables. Metallurgist Richard Williams introduces us to Abraham Darby, whose breakthrough in cast iron pot-making technology funded the R&D that led to the Industrial Revolution. Brown University epidemiologist David Savitz joins us to discuss the question of whether or not the chemicals involved in Teflon pans cause health issues. Finally, food science guru Harold McGee, author of On Food and Cooking, helps us answer a seemingly impossible question: What makes the perfect pan? Listen in now! Patrick Maher shaping the handle for a Blu Skillet pan. Photo by Cynthia Graber. Finished Blu Skillet pans. Photo by Cynthia Graber. 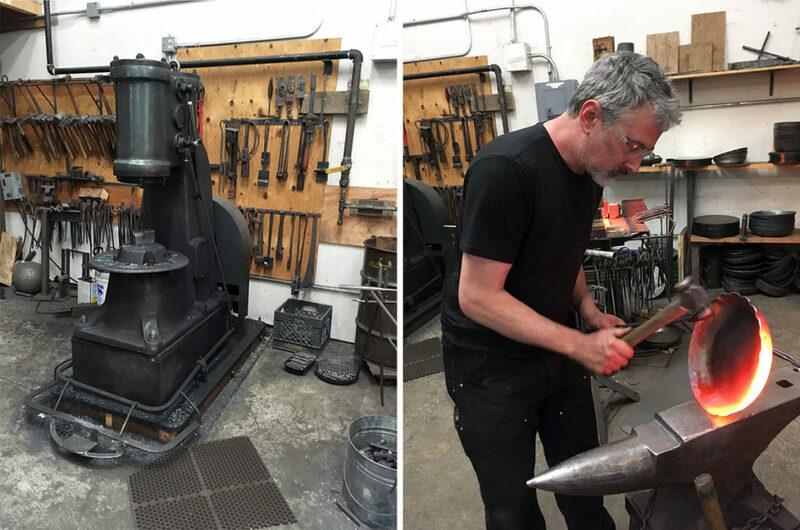 Thanks to Patrick Maher and Caryn Badgett, who welcomed Cynthia into Blu Skillet‘s studio in Seattle’s Ballard neighborhood to watch a pan being made. 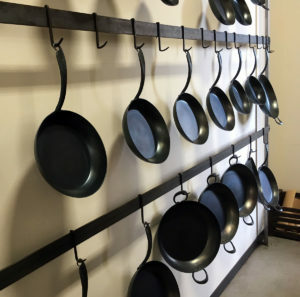 For locals, Blu Skillet hosts studio sales twice a year; otherwise, if you’re in the market for one of their hand-made pans, you’ll have to try your luck in their monthly lottery. They’ve been selling out regularly ever since this piece in Cook’s Illustrated on carbon steel that featured their work. Bee Wilson is a food writer and author of Consider the Fork: A History of How we Cook and Eat, among other books. She’s a Gastropod regular, having starred in our very first episode, “The Golden Spoon,” as well as “First Foods: Learning to Eat.” You can find engineer Chuck Lemme’s reflections on the ideal pot in the 1988 Proceedings of the Oxford Symposium on Food & Cookery. Julie Dunne is a biomolecular archaeologist at the University of Bristol. Her study on the potsherds found in Libya can be found here, and she’s current working on a multi-year project called Peopling the Green Sahara, which explores the ecological and demographic history of the region. 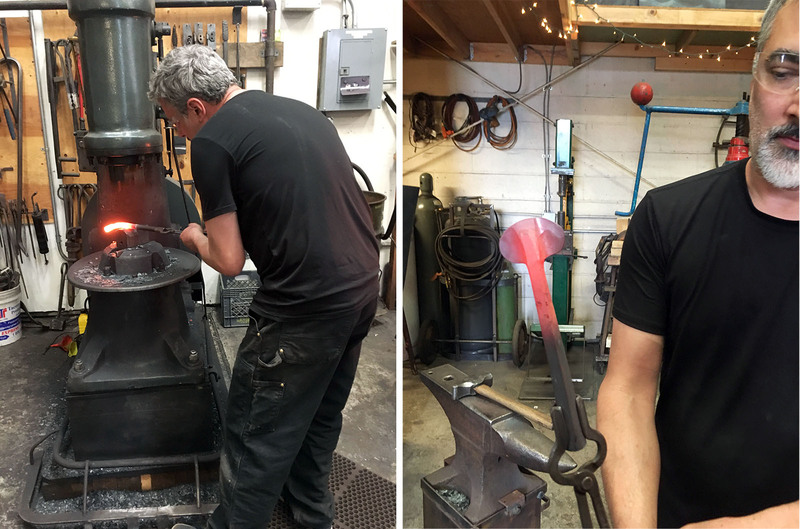 When metallurgist Richard Williams was asked to examine a cast-iron pot in the collection of the collection of the Ironbridge Gorge Museum Trust, he uncovered a story that led from kitchen wares to the Industrial Revolution. Brown University epidemiologist David Savitz was asked to look into the health impacts of a chemical used in making Teflon called PFOA, as part of the settlement in a class action lawsuit filed by people in Ohio and West Virginia who lived near a DuPont manufacturing factory. The C8 panel he was part of published research on the likely links between PFOA in drinking water and a number of health outcomes. For more detail, here’s a long Mother Jones article on the lawsuit. Dupont and the chemical industry as a whole have since phased out PFOA, though there’s a debate about whether the replacement chemicals are significantly safer. Harold McGee writes about the chemistry of food and cooking, most famously in his book On Food and Cooking. He’s starred on Gastropod before, trying to help Cynthia overcome her dislike of cilantro, as well as explaining the mysteries of caffeine. The post Out of the Fire, Into the Frying Pan appeared first on Gastropod.